In my previous post, I shared a free lesson you can use to help kids master difficult concepts faster, which is something they can use to make their school experience less frustrating and more rewarding. In my next two articles, I want to share with you a strategy that works well for developing good study, work, or life habits. As habits are automatic behaviors, we rarely think about them. We just "do" them. That's the first problem we face - we don't take the time to identify our detrimental habits. The second problem is we don't devise clear plans to change because of this limited introspection and lack of expertise on how to even begin. You might know from experience that telling yourself I'll try to do better tomorrow rarely works. To develop good habits you must first identify your bad habits. Next, you must identify the "opposite" habits - good habits that contrast the bad ones. Then, you must come up with an effective plan to replace a bad habit with a good one. Finally, you must do it consistently until you achieve "automation." The images below show a lesson I use in my Learning to Study Effectively class to help high school students identify and understand their habits. I usually start with a short activity (not written on the document) asking each student to write down 5 ineffective school, study, or lifestyle habits they have, share them with a group of peers, and list the ones most or all of them struggle with. This is followed by each group using a representative to quickly share and explain their bad habits. This is engaging because students like learning about themselves and they realize that many of their peers experience the same struggles. When the discussion is over, I ask the students to read actively (another strategy I teach), use the checklist provided in the reading to check off and add any unlisted bad habits they identified, and summarize the key points of the reading. Finally - and this is the most important part - I ask them to apply what they learned. First, they identify the effective learning habits which helps them realize things "aren't so horrible." Second, they list habits that slow down or prevent their learning which helps them specify what they need to work on. Third, they work in small groups to research, write a script, and record a short video on habits. Communicating in this way helps them better understand what habits are, how they form, why they are so darn difficult to change, and begin identifying the things they can do to start developing more effective habits. Fourth, they reflect on what they learned and self-assess their understanding of their own patterns. Notice that the majority of time is spent processing information (reflecting, communicating, designing, creating etc.) not receiving it. The lesson above is one of the two lessons on habits I use with my students. 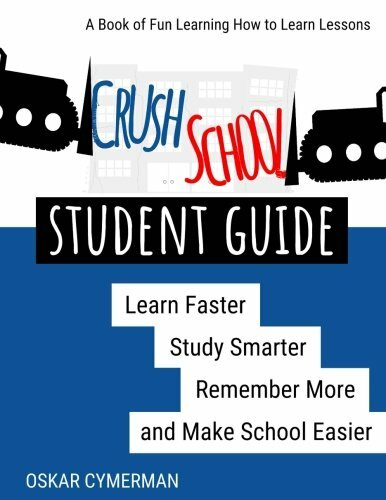 I included this lesson, and Lesson 21 - Changing Your Habits, in my new book Crush School Student Guide: Learn Faster, Study Smarter, Remember More, and Make School Easier. Please feel free to use the Understanding Your Habits Lesson in any way you want. It is my gift to you. It can help anyone understand their habits so they can start working on changing them. You can download the Free PDF copy here. My next post will feature the "Changing Your Habits" lesson, so that you have the complete set you can use to teach your students or children about habit development and show them how to take action on developing more effective habits. The book comes out on Amazon this Friday. You can pre-order it here. If you're not sure if the book is for you, don't buy it until you know you or your kids can use it. I will continue sharing different lessons I created for it in my future posts and you can decide then. As always, I am grateful for your time.